Showcase your hard work and years of study with a fabulous trinket box! Use it to store those memories and treasures. 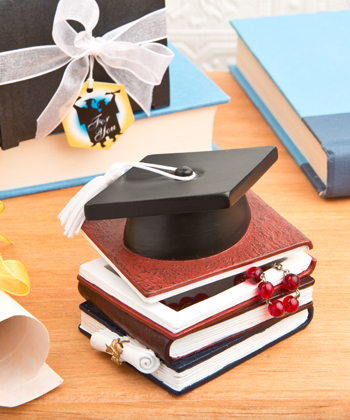 Graduation days demand a great gift and this is an unusual and fun idea. Offering the symbols of hard work, scholarship and achievement, it also doubles up as a useful trinket box. Crafted from polyresin, this fabulous box features three books piled on top of one another. A rolled up scroll with a gold trim is attached to the side and a black graduation cap with a white tassel adorns the top. Open the box and store away those fabulous mementos and treasures from your years of study. This is the perfect gift for a graduation occasion. Different, unique and useful it is bound to be top seller on your shelves! This is a stunning and different graduation gift!